Balloon Racing is a 1-to-4 player Action Minigame in New Super Mario Bros. The player must blow into the Nintendo DS mic to make Yoshi float with his balloons and get on the Airship. an obstacle there are many Fly Guys moving horizontally to stop Yoshi's ascension. If Yoshi is hit by a Fly Guy, one of his balloons will pop. 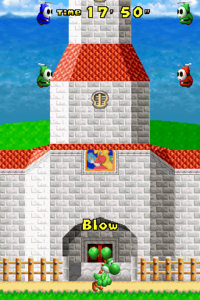 The game results in a Game Over if time runs out, both balloons are popped, or Yoshi falls below the bottom screen. The goal of the game is to reach the top in the shortest time possible. In multi-player, the goal of the game is to reach the top first before the player's opponents. Losing all balloons results in elimination from the contest. If no one gets to the top, whoever is closest wins. If everyone's balloons pop, it is a draw. This game has adjustable difficulty. The harder it is, the more Fly Guys there will be. Blow into the Mic to send Yoshi flying skyward. Yoshi's balloons will burst if he hits a Fly Guy. If all the balloons pop, Yoshi will fall. Can you reach the goal before time runs out? This page was last edited on March 26, 2019, at 21:32.